VisitSweden has the PR opportunity of a lifetime! | Start snakken! This entry was posted on 0 13. juni 2012 at 6:09 pm and is filed under Cool stuff, Medier, PR, Sociale medier, Underholdning. You can follow any responses to this entry through the RSS 2.0 feed. You can leave a response, or trackback from your own site. 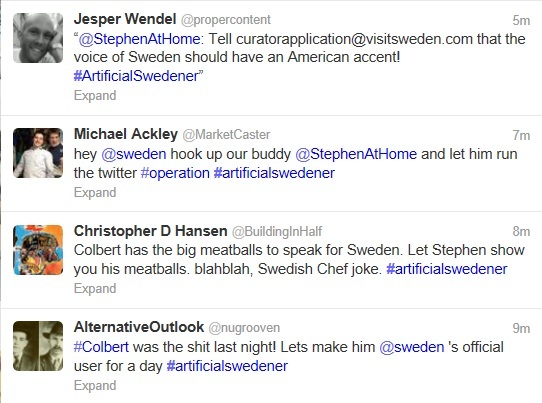 One Response to VisitSweden has the PR opportunity of a lifetime! Har man sagt A må man sige B og Colbert som gæsteblogger…uanset om han har været i Sverige eller ej, ville være et kæmpe scoop.